In the context of and guided by the principles of the ‘Delhi Group: A Forum for International Relations in the Global South’, the PhISO-GSCIS workshop aims to serve as a critical academic platform for thinking and doing IR differently and beyond the Global North’s IR perspectives. It advances cosmologies of diverse ways of contemplating the ‘international’ as a form of study, discipline, and reality. It focuses on theoretical, methodological, empirical, practical/policy-oriented research works and studies of IR within the context and perspectives of the Global South. Since the event is co-sponsored by the Philippine International Studies Organization, PhISO is very keen on developing a ‘Philippine IR’ in the literature. It is PhISO’s humble contribution to the emerging non-Western IR movements such as those of the Chinese IR, Islamic IR (works of the Co-IRIS team), the surgical analyses of ‘Worlding beyond the West’ book series, religion and IR, and post-colonial IR. It aspires to trace the historical development of Philippines’ involvement in international society, particularly as a founding member of ASEAN, member of Non-Aligned Movement and G77, and one of the first Asian countries to nationalize and democratize its governmental institutions. The workshop hopes to present locally produced IR knowledge in the Philippines as a part of the trends in Asian and other global south IR approaches. With this in mind, contributions that open up mutual windows of old and new boundaries, spaces and civilizational discourses of “holistic IR” are welcome. These include shared stories, exchanges of cultural nodes, historical experiences between and among Global South traditions such as from Asia (especially China and India), Latin America (such as the Dependency School), or Europe and North America; or from culturally-specific and trans-regional traditions (such as from Islamic or Confucian perspectives), and modern critiques via neo-Marxism, Postmodernism and Critical IR theory. 2. Dialogues between Western and non-Western interpretations of IR. 3. Ideas about IR pedagogy, Global South curricula, and comparisons and contrasts with IR curricula in the Global North. 4. Publishing experiences and/or difficulties of Global South IR scholars in getting published in English-IR publishing houses and journals. Proposals must include an abstract of not more than 250 words (minimum of 170 words), 3-5 keywords, and a 100-word short biographical note (minimum of 50) indicating the name of the author/s, institutional affiliation and research interests. Submissions are emailed with a heading ‘PhISO-GSCIS Workshop’ to conference@phiso.org on or before 20 November 2016. 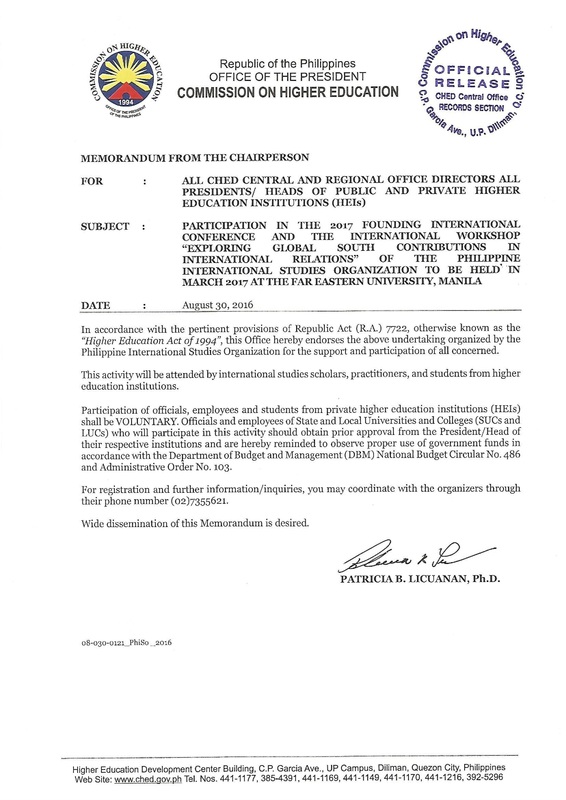 GSCIS will provide travel assistance to selected non-Philippine based Global South IR participants, as determined by the GSCIS Advisory and Executive Committees. Participants are responsible for their accommodation and travel expenses (except for travel grantees reimbursed by GSCIS). Participants are advised to book at the Bayleaf Intramuros so that travel to and from the university can be facilitated. The price of single or double occupancy room is between $35 and $85 per night/per room (inclusive of breakfast and Wi-Fi internet).